The second last day and we don't not want to repeat ourselves, so we wander off to the Hill of Lycabettos, read wiki here. On the way to the Hill we passed by the central meat market (an interesting pic on the right - a sight not seen on the Danforth!). We have seen many a meat market but this one was the best. Cleanliness and quality reigned supreme. This hill can be climbed, if you are fit, healthy and young - rather like climbing the stairs of the CN Tower, or one can take the easy way - the funicular. This three minute ride was inside a tunnel rather than being attached to the side of the Hill. Not very interesting. But when one emerged at the top of the ride what a view. The day we were there it was overcast and the visibility was not good but we could still make out all the landmarks. There was a full sized restaurant and an Orthodox Church - Chapel of Saint George, albeit a small one, that covered the summit. One could walk to the Theatre (read the wiki for a description) on another smaller peak of the same hill. Coming down the hill after the funicular was easier than going up. The ascent to the funicular station was by means of many galleries of stairs. At the bottom one of the many coffee shops (pic on left), this was was probably the best one for street ambience, it was situated in a 'toney' neighbourhood, supplied the necessary refreshments to us both. This street was also directly above the road where the National War Museum was located - we entered. This Museum was a large one and contained artifacts regaling the exploits of the Greeks in War from the earliest of times of conflicts in the Aegean area to the latest conflict when the Greek government supplied the equipment and led the Cypriots against the British in the EOKA campaign in the Sixties. An interesting way to spend half an afternoon. Noticing that a site that we had not visited was just around the corner we trotted off to see the Lyceum of Aristotle (wiki here). Again all one can do is wonder when near to, or on the places that these great Ancients strode upon, anyway I do. We set off to the Metro station, this site was a way from the hotel and we had planned to ride back. But those plans went all to naught as the Transportation Workers had pulled another 48 hour strike to protest the latest "austerity bill" passed by the legislature. The fitbit exploded on that walk back! The last full day was spent trying to pick up genuine olive oil in a bottle or can, the mini-marts only sell the oil in plastic containers, certainly not hardy enough for modern air travel, so we strolled around the now familiar sites for the last time - we found one, but it was in Monastiriki, a twenty minute walk away. Again we had to walk as the transportation workers are still on the two day strike and the Metro was shut down. Being a Sunday morning we almost had the streets to ourselves. Another overcast day with spots of rain. Corinth and the wine tour: After returning from Santorini we didn't have too many plans but we thought a trip out of Athens would show us the Countryside. It did. Two hours on the bus, must say we don't know what is worse; a tour guide that never shuts up or one that just sits there waiting for questions. This guide talked non-stop for five hours.Travelling South we saw the Coast and its inlets and the lowland crop farming. Arriving at the Corinth Canal we stopped at the first truck stop I have seen dedicated to tourists, and the number of tourists must be down because half of the building catering to tourists have shut down. The idea of a canal that connects the Aegean Sea and the Gulf of Corinth has been around since the birth of Christ but only in the 1880s did anybody do anything about it. The problem is that although it works it is too small for normal shipping. Read the wiki here. Corinth is another settlement that has been excavated to reveal complete civilisations. The museum holds some of the relics found on site and the site has some building foundations that show the culture of the time. The large Agora in the middle of the site, the tree on the left is in the middle of the Agora (public place/Mall) and was the place that the Apostle Paul preached to the Corinthians. The claim to fame on this site was the Peirene Fountain (pic on the right). One storey of this two storey building remains and one can see the former magnificance still. And the large columns of the Temple of Apollo still stand (picture at the head of the post). These columns are different from other columns we have seen in that they have been carved out of one piece of sandstone as opposed to the usual marble columns that are assembled in pieces. Moving on to the winery we turned up at the Skouras winery - check out their website, this outfit bottles seventeen labels and a few million bottles a year. It has won tons of awards and is very successful. The wine doesn't taste too bad either - we bought a bottle after we found that out in a tasting session during the quick tour of the property. Back to the hotel - only two more days left. Up at 5am for a 6.15 pickup and then we are on our way. The Blue Star ferry line will take us to Santorini, stopping at Piros, Naxos and Ios on the way. We were assigned seats in one of the many seating areas and we noted that these areas were not full. but the boat was busy - all of the public areas - lounges and cafes were full. Obviously a lot of people only paid the basic fare - 20 euro, why wouldn't they; there was plenty of room. The trip was supposed to take eight hours and it did, even though the load and unload at Naxos took longer than expected - too many commercial trailers. The ferry was unlike any ferry we had been on before, it was like a huge airport lounge, plenty of seats and slick bars and cafes - even a duty free store. The prices were as high as airport prices but good quality. All in all a good travel. Arriving in Santorini was a rush (crowds of people) but the driver was waiting and we sat on the minibus with another couple as he climbed the six hundred metres up the hairpin road to the top road that bisects the Island and where our hotel was located some two kms from the biggest Town; Fira. We visited Fira last night as we wanted to see what real prices were like as opposed to Hotel prices. We don't mind paying higher prices for the convenience of not going into Town but HIGHER prices are the norm in the hotel. Place looks OK - typically touristy and we ate in a place where the boss enticed us in with the offer of free wine. Despite that the Hotel location was georgeous - hanging off the cliff. Fira seems to be fast-paced, filled with traffic and the usual tourist stores abound. But the outstanding feature was the way the Town has been built on the cliff and the connecting lanes - very picturesque. A bottle of wine was purchased in a really nice store filled with local goods - wine and the like. As we paid up the salesclerk offered us a couple of plums - tasty and unexpected. We will be back in Fira Wednesday, we only have one full day here, we return to Athens on the ferry leaving at 2.30pm Thursday. Back at the hotel we drank the wine and watched the sunset, this is what the tourists pay big bucks for. After a breakfast fit for a Queen we set off and walked the 2.2 kms to the Town of Fira. Using the MapsMe app on my phone we followed the road that followed the coast line and discovered, to our delight that was the connecting alley for all of the villas, hotels and homes that are hanging from the cliffs. Wonderful pics to come. Unfortunately I had forgotten to pack the sd card reader that I use to transfer the pics to the netbook. Looks a pile of work to be done back in Athens. At this time I am fighting the internet, we are staying in a five star hotel and normally we do not complain about a thing whenever we travel, except if it really bad, but staying in a five-star these things are not supposed to happen. The front-desk just shrugs and says "The Island internet is not good, slow and goes off" Well I guess it does. But if the internet is the only thing we can find to complain about it must be all about us!!! But back to the walk this morning - we found the Santorini of the guide books and films. Luxury villas and hotels hanging from the cliffs, restaurants begging for business and tons of tourists - four cruise ships were in Port today - just like yesterday and the day before. So fighting our way through these small streets we did find cheaper stuff than the goods just by the disembarkation point at the cable car. These folks, cruisers, have a choice to get up the cliff - a cable car, donkey rides (mules really not donkeys) or walking. A two hour walk around the streets covered all of Santorini's merchandise and we settled down in a local Taverna to await the shuttle back to the Hotel. The accumulated loot was three Tshirts a tea towel and a top for Doreen. These items were just more plentiful than having to look for them in Athens. Impressions of Santorini: a really picturesque place, a good place to spend a week by the pool and go out at night but the cost of doing so is far beyond the average Joe's vacation pay. Back on the ferry: but not after a huge breakfast, courtesy of the Volcano View hotel, but before that we had taken a trip to Oia (pronounced) eeyah. This village is much the same as Fira in design and appearance but smaller in size. The quality of the goods is higher. Almost as though the people who arrive here are richer and can afford the prices. Doreen had wanted to see white cottage with blue roofs, just like the tourism pics. The only blue roofed buildings were the churches. There were enough to fulfill the fantasy and it was worth the trip. We managed to fit the day trip in because the public buses were really good and prompt. These buses, just like tourist buses but with a label on it that said "local bus" were cheap and available. A taxi to Fira (10 euro) a bus to Oia (1.60 euro) and the hotel shuttle back to the Volcano view and it was all done in a four hour period. When travelling to the tip of the Island the terrain shifted. the road was on the edge of the mountain and we overlooked the flatland by the Coast. We certainly saw the Northern part of the Island from this bus. The fields shared some crops - vines and tomato bushes with the hotels that abut right up to the beach (not a nice beach, you want that, go to Mykonos). As with everthing else the return trip was flawless and the pickup on time - thanks to Fantasy Travel - Athens. Two more days in the neighbourhoods. 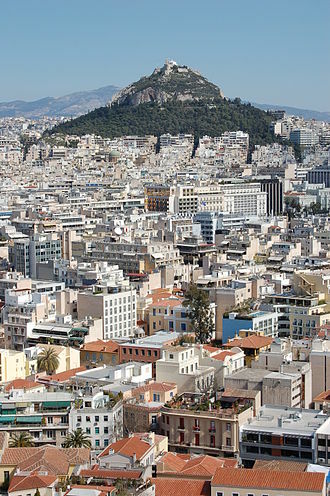 Athens is Utopia for active tourists who can walk themselves around the City, and the inactive ones can use the Metro! We say that because the main sights and ruins are clustered in the bottom half of the City and very close together - after all just how many Greeks and Romans lived here in 1 AD? Even today the distinct neighbourhoods, which are clustered around many of the Plateia (Squares or traffic intersections) can be walked to and from. 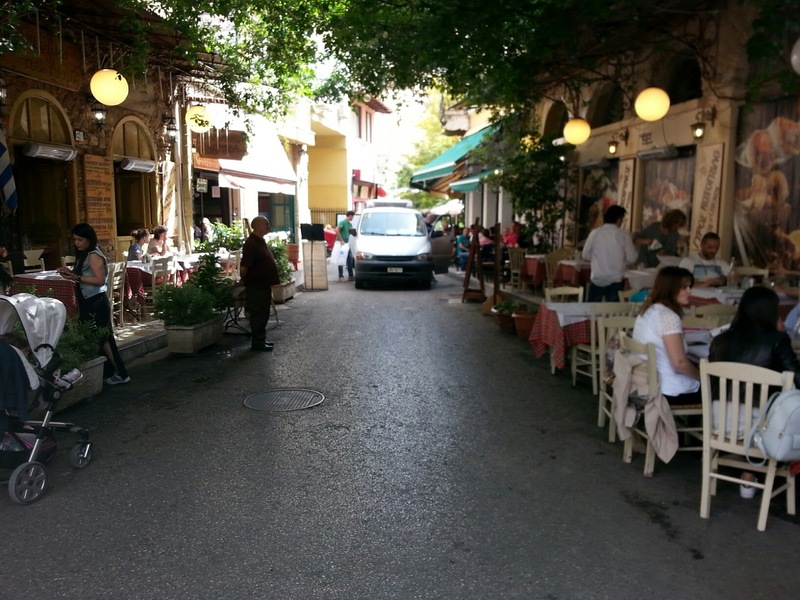 Usually most tourists never get past the areas of Plaka and Monastiriki, that is because a lot of hotels are located there and also they are the liveliest shopping areas found in smaller folksy alleys and streets. They are obviously the most expensive places to shop. We have made it a practise to explore some of the other neighbourhoods as we visit the sights in the guide books.For example today we went to the National Archaeological Museum (NAM). This was located outside of the normal area that tourists visit and when we were done, we had walked ten minutes to get there, exploring the Exharhia neighbourhood was the order of the day. Nothing special, just a place we hadn't been to before. However passing buildings that look interesting certainly sparks questions. Just South of the NAM was a huge complex of stately buildings that looked abandoned and certainly underused. Festooned with protest banners and more than the usual amount of graffiti we noticed that the gates were shuttered. But turning towards Exharhia square we passed the main entrance. "let's go and look" Talking to one of the many young people just hanging around I asked, "Just what is this complex?" "The National University of Athens." was the reply. Checking further it was the Fine Arts and Technical Campus. No wonder the graffiti was so colourful and imaginative. Getting to the neighbourhood locus - the square - we sat down, rested our feet and ordered the mandatory thirst-slaker - "One white wine and an Alpha beer, please" Came at a might fine price! Yesterday we explored another mandatory tourist sight "the Monastariki fleamarket" It takes place in the normal place of the fleamarket except on Sundays the amateurs come to Town. They fill the open spaces of the market and some of the nearby streets swelling the number of dealers/vendors twice normal size. Of course three cruise ships were in the City and the number of 'lookyloos' swelled as well making it almost impossible to walk at your own pace. This event came after us watching the Weekly Changing of the Guard at the Parliament Buildings. On Sunday they put on a bigger pageant and a Band and the Platoon performing the Sentry Duty is there as well. The video shows the parade as it marches from the Barracks to the Parade Square and the Tomb of the Unknown Warrior. These soldiers are wearing the White traditional uniform, on other days they wear the Khaki No. 2 dress. Being both walked out and thirsty we moved over to a semi-touristy area - Iroon Square. 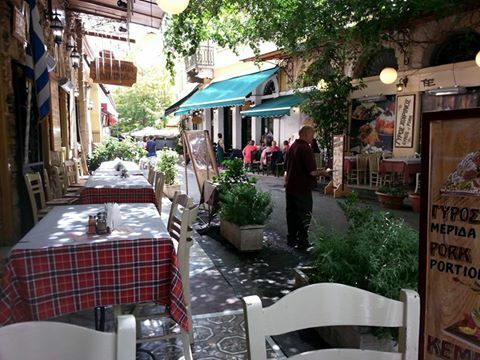 This is smaller square than most but it is definitely the gastronomical centre of Athens, if you judge it by the number of eating establishments per square inch. Settling into a minibrew pub type of place we wimped out and went commercial - white house wine and a Greek beer. But the people watching was fantastic. This place, the brew house was one hundred metres from the place we ate lunch at yesterday. 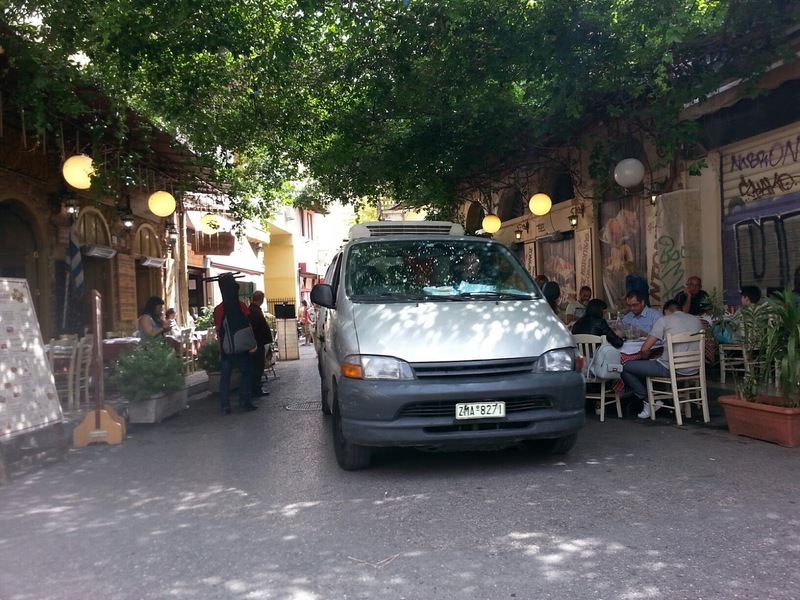 That place, the Taverna with the Secret Garden, takes over the whole street with its tables. A bit of a shock to find the traffic doesn't doesn't stop for the diners, but it was worth it as we said in a FB post, "I would pay for this view even if we weren't eating here!" But back to today. This morning at breakfast were discussing what to do when we return from Santorini on Friday. Finding a tourism booklet in the lobby we decided that a trip to Corinth and a wine tasting trip would be good. Told on the phone to book online the credit card we had was not acceptable so jumping on the Metro, it is so easy to get tickets and being of that age we qualify for a half price ticket; this way to travel certainly is the better way! Arriving at the travel agent we were told "You should have booked at the Hotel!" Anyway we paid cash and then because we down near the sight Ben decided to see "Socrates's Prison". Following the map we found it - just yards away from the bus stop we had waited at for so long on the first day. Back on the Metro four stops later we were at the NAM. Some guide books tell you that a day is not long enough to see it all. I guess it wouldn't be if you were on the tour that we passed several times as we circled the rooms to get the next rooms. Those poor tourists had glazed eyes well before this guide finished explaining each item in the cases! Anyway we zipped through in about three hours, took plenty of pics and enjoyed the place. At least these artifacts were in the air conditioning no in the day's temp of 32 C.
On the way to the hip area of Gazi, a repurposed industrial area we passed a rack of ruins. Looking at the map we found out it was Keramikos, an Ancient burial ground situated outside the City walls. Today, the excavated area yields many artifacts as the whole area lay undisturbed until the late 19th Century and covered by centuries of sediment flowing down the Eridanos river. A tranquil area to explore. Walking another five minutes West the first sight to be seen were the three chimneys and the two gasometers of the now defunct Athens Gas Works. This industrial site provided all of the industrial and residential gas for the City built in 1862, it shuttered in 1984. History here The area is now home to a huge multipurpose cultural centre. The original buildings are also complete and are now a living breathing museum. Today the site was hosting a "Coffee Fair" many coffee makers and suppliers of coffee paraphernalia were set up in the buildings and kiosks. Just how much coffee can one drink? That question was never answered as we tasted very little. We explored the complete site and one of the more interesting enterprises found on site was a Company that was called "Dinner in the sky". For 120 euros - $180cdn you can get a five course meall and all the wine you can drink and view is priceless - well that's what Alexandros the salesman said! Ironically after we left the Coffee Fair the first thing we did was to walk around the square looking for a place to sit down and have a coffee!! Walking back to Monastariki Square we followed now familiar streets but in this lively and everchanging City these streets are never the same. So everyday is a new experience. Lunching in the Iroon Square area, some two hundred metres North of Monastiraki the place was lined with Cafes and Bars. Picking the one that served fish we idled a couple of hours away. We didn't realise it until we had been placed at a table outside the Cafe that this establishment also had the tables on the other side of the street. It was enlightening to see traffic driving down the middle of what would normally be one big patio. Another sight seen today was the inside of a large Greek Orthodox Church, the interior, as usual was enchanting and exhilarating to see. This pulpit may not have been the most elaborate I have seen, in other places, but just as impressive in its own way. An example of positive graffiti may be this decorated storefront, it would never fly in downtown Cobourg but fits right in here. The traffic was worse today, Friday than yesterday, and the streets more crowded, I guess as we approach the weekend we can expect crowds to grow. And we chose yesterday and today to start our exploring on foot. The hotel we booked, a mighty fine one and reasonable too, is about thirty minutes from the sights and shopping areas. But in the absence of Malls and Shopping Centres/Supermarkets the neighbourhood stores flourish. Too many coffee shops to count and mini-marts abound. Yesterday we chose to walk to Monstiriki Square (the starting point for many City walks), the large square that is the hub of the City on Athinas St. A kilometre of a wide Avenue lined with stores and cafes but stretches have lost their storefronts die to urban decay. Arriving there we went to the Roman relics, the Romans didn't adopt the Greek areas but chose to replace them, but as the Greek Agora was next to the Roman Agora we saw them both. But first up was Hadrians Library, a huge place that in its day housed all of his donated artifacts. The pic on the left is a reconstruction and the one on the right is a shot of what's left - the entrance and a few columns. It should be noted that we were doing these relics in one shot because the Museum ticket - 30 euros each had an expiry date of five days. The Roman Agora (meeting place and shopping areas) was next. This site also had a Roman structure called the Tower of the Winds. An early weather station and waterclock. As well we had a public bath house complete with ablutions and latrines. Picture on right shows a "two-holer"
This site was interesting because it still had a Temple - the Thession, still standing (because it became the Church of St George and lasted until the 19 Century) and almost complete. But it was an uphill climb to get there. Another curious site was an original well, and notice the years of use had worn grooves in the stone from the lifting ropes. Only one more Antiquity on the Museum ticket that we wanted to see so we nipped over there today. The Panathenic Stadium was built by the Greeks in 330-329 BC the Romans in 139-144AD changed the shape of the arena from rectangular to horseshoe. Over the following centuries it became severely neglected and some of the marble was relocated but in 1870 Baron Pierre de Courbertin revived the place and it was used to host the first Modern Games in 1896. The enormous expense of renovation was borne by Georgios Averoff. So as we had to use our bus passes in 48 hrs we did the other route today. These routes took us to the Coastal areas. 14kms away from downtown. We did get lucky, the green and the pink lines were combined and left from the Acropolis terminus, instead of having to get off in the middle of nowhere and transfer. The weather was not as hot and sunny as yesterday which made for better walking but rather a windy trip on the bus. This route took us through the area that was used for the Olympics, and it appeared that perhaps these facilities were carved out of virgin land, there is nothing there now except the facilities, and as Greece has abandoned them due to the crisis they are now very tatty and forlorn. Now they look worse as they have just dropped the Syrian refugees into the mix. As we arrived back at the terminus earlier than planned that left time for a browse around the souvenir stores in the touristy Acropolis area. Doreen saw a pretty little Grecian urn (no jokes please about what does a Greek earn!) and when the owner of the store said "100 euros but there is a discount down to 80" she remembered the same urn costing 129 at a store near the hotel, it was a done deal. Now we know what the City looks like and where the sights are all we have to do for the next few days is explore the ones we want to see. 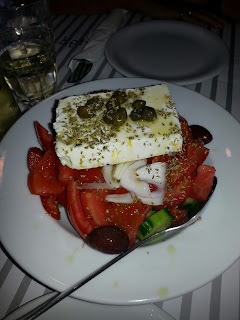 Went to a little hole in the wall place to eat last night - Kokkinos Krinos - wonderful food, not fancy but plenty and the right price 28 euros for two with a half litre of wine $42. The Geek salad was memorable. Impressions of Athens so far: few if any beggars, only a couple of middle-class people foraging in the bins for cans, the streets cleaner than expected but the overall impression was one of a lot of dingy 50s/60s building that have seen better days. No protests yet considering that the |Parliament shafted the people on Sunday. This was the site from the bus stop at the bottom of the Acropolis. We had not intended to visit this classic site today, after all all we wanted to do was to ride the buses. Hopon Hopoff buses that is. Our usual first job is to sign up for one of these tours and scope out the City we are visiting. But the Athens tour has four routes - an all day job. But when we had finished the Blue Line the terminus being at the Acropolis and finding out that the the next route - the Red Line, was going to be three quarters of an hour coming in Doreen suggested that "We are going to be here for a while why don't we do the Acropolis today?" A predictable suggestion as Doreen doesn't do sights and museums well and she obviously didn't want to come back again. So off we set, up the hill to the ticket office and was pleasantly surprised that despite predictions from all the guide books make the site was not really crowded and the sun wasn't all that hot. The cash kiosk line was much shorter so we whizzed through and climbed the marble steps to the first Temple. One thing we discovered very quickly - marble is slippery and made the climb a little dodgy. Through the first gate/Temple we saw the plateau had only one site that was not in ruins. The Parthenon was scaffolded on one end and was obviously under some sort of reconstruction. Just how much will be done is under debate, but the Turks certainly blew this place up in the 1600s. We stayed about half an hour, enough time to wonder the wonder and walk from one end of the site to the other. Coming down the marble more carefully than when we went up the Red Line was waited for, boarded and we toured the Piraus area. Halfway around this route our stomachs caught up with us and we stopped at a place called Mikromilano. It looked liked a marina left over from the Olympics and the view from the bar/cafe, called BeerCheers was picturesque and Islandy certainly not downtown Athens. If you ever have to use transit or taxis inn the rush hour expect to be late. It was not a fun trip in the sun on the top of a sightseeing bus, especially if you had seen the sites a couple of hours earlier - hey all we wanted to do was get back to the Hotel. Been here six hours and haven't seen a ruin! When we decided to come to Athens we picked our hotel the way others might - at random and online. Using the filters on the internet site - we will not name it because they haven't paid us to say it, we start off with a three star breakfast included and look at all the pics and the reviews. Must say it has worked for us no dogs yet and this hotel doesn't appear to be one either. But it is quirky. Two elevators are in the lobby and are used to get to all seven floors, BUT they are mighty small - no claustrophobics need ride these puppies. I am sure one of them may have been used in the Chilean Mine Disaster a few years back. They work and we used them. The hotel is positioned around one of the many squares (roundabouts) that funnel traffic in and out of the City streets. On the sixth floor we have a birds eye view. Walking around the neighbourhood for an hour or so this afternoon, we noticed a couple of things. One the neighbourhood is efficient but working class, most people speak good English and we could get anything we wanted - the bottle of wine went down very well and only seven euros. Also food prices tend to be a bit more expensive than first thought but one can find two euro coffees and two and half euro beer. One euro is roughly one and a half times a dollar - easy conversion. Tomorrow we explore the City with the Hopon Hopoff buses. I do not usually write about air travel - it is so mundane and routine; unnoteworthy. BUT this flight was noteworthy but not to the good. All was well until the time for the advertised evening meal. We have seen levels of service fall so fast in the last few years we have often wondered what the bottom would be. Well AirTransat might have hit it with their latest culinary adventures. 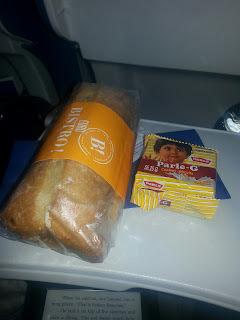 Dinner was a choice of sandwiches, six to choose from but only three were available by the trolley came to the back of the plane, and the dessert (their words) was a package of six small cookies. Breakfast was even lower - a piece of Banana Bread and beverage. So be warned if you fly AirTransat - the food is crappy and meagre, but rejoice if you are a shareholder all the profits squeezed from the cuts go to the dividends.